Sometimes it’s difficult to see the good in others, especially when the others look bigger and stronger. Differences can be frightening, but they don’t have to be. Muffy was a small dog. Injured by another dog, a bigger dog, Muffy decided that all big dogs were bad and it was important to bark at them. Valor was a big dog. He lived far from Muffy. But one day he became lost and was hit by a car. His injury was similar to Muffy’s, so when Muffy’s owners rescued Valor, Muffy felt compassion for the big dog because of his injury. The two bonded and, even though Valor’s owner eventually came to reclaim him, Muffy learned a valuable lesson, that one cannot judge another by how they look and one shouldn’t let fear rule our feelings. 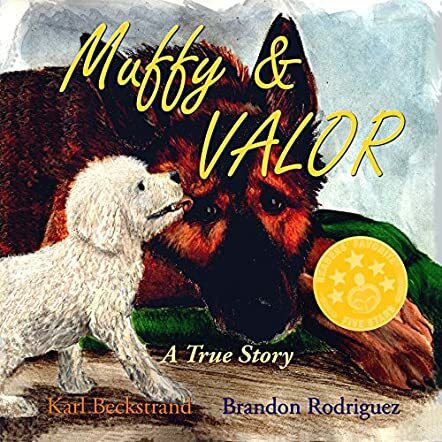 Based on a true story, Karl Beckstrand’s picture book story, Muffy and Valor: A True Story recounts a memory of a much loved childhood pet. The lessons that Muffy had to learn are ones that we all have to learn and this is beautifully presented for young readers to not only enjoy, but also to learn from, as Muffy had to learn. Printed using dyslexic-friendly font and with bright, colorful illustrations, this is a heartwarming story for young readers. The plot is simple and the messages quite clear: don’t judge others by how they look, be compassionate, be courageous and know whom to trust. Follow the example of a little white, fluffy dog who had to overcome her fear. A memoir and a cleverly shared story.